Deborah Sawyer and Darius Sawyer declared their intentions of marriage on Oct 29, 1743 Lancaster, Worcester Co., MA, USA. Amos Sawyer married Mary Rugg in Jan 9, 1755. 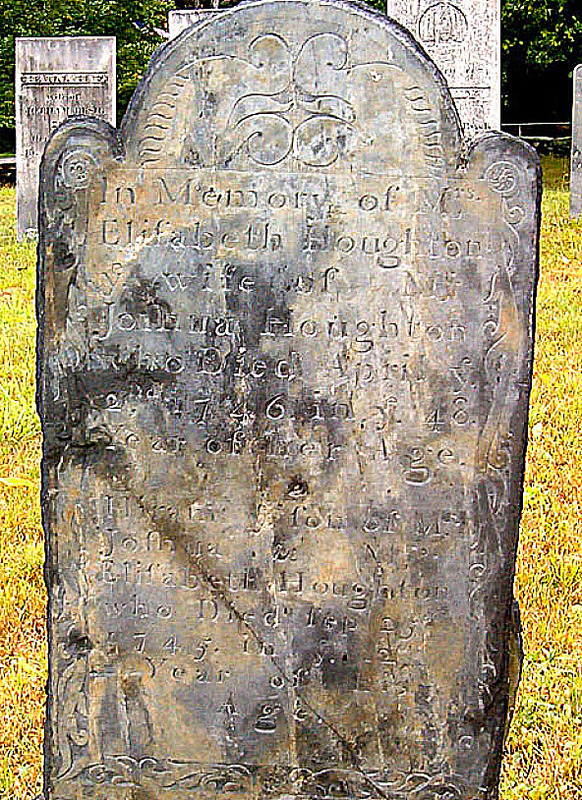 Death Nov 7, 1763 Groton, Middlesex Co., MA, USA, "in her 72d year (gravestone at Groton)." November the 7th AD 1763 in the 72d year of her Age." Deborah Wilder married Robert Houghton Jr, son of Robert Houghton and Esther Leppingwell, BT, LWL: questions marriage of D. Wilder and Robert Houghton; CJV: probate records verify marriage. Deborah Wilder married John Longley in Nov 30, 1720 at Lancaster, Worcester Co., MA, USA, Lancaster VR: p.18: Deborah Houghton, by J. Houghton; Littleton VR: 1718. Death before 1727 MA, USA, CJV: not given guardianship in 1727 nor inheritance in 1733; Burr & Gage: "oldest son, deceased in 1727." Esther Houghton married Moses Woods in Nov 22, 1733 at Groton, Middlesex Co., MA, USA. Esther Houghton married Ens. David Shattuck in Jan 10, 1758 at Pepperell, Middlesex Co., MA, USA, His 2nd; Easther Woods (Esther CR 1); Shattuck: Esther Woods, widow of Moses Woods. Ebenezer Houghton married Susannah Farnsworth in Jan 9, 1751/52 at Harvard, Worcester Co., MA, USA. Birth 1717 Lancaster, Worcester Co., MA, USA, Burr & Gage: "ten years old in 1727"
Deborah Houghton married Jonathan Holdin in Apr 26, 1742 at Groton, Middlesex Co., MA, USA. Elizabeth Bennett married Joshua Houghton, son of Robert Houghton and Esther Leppingwell, in Apr 8, 1719 at Lancaster, Worcester Co., MA, USA. Jerusha Houghton and Nathaniel Bixby declared their intentions of marriage on Aug 27, 1742 Lancaster, Worcester Co., MA, USA; FWH: mar 1741; MLM: also int. Dec. 6, 1741. Jerusha Houghton and Nathaniel Bixby declared their intentions of marriage on Sep, 1742 Shrewsbury, Worcester Co., MA, USA. Saul Houghton and Mary Matthews declared their intentions of marriage on Apr 11, 1746 Lancaster, Worcester Co., MA, USA; JWH, MLM: 5,11,1746. Orphah Houghton and Josiah Cutting declared their intentions of marriage on Oct 1, 1751 Lancaster, Worcester Co., MA, USA. Orphah Houghton married Josiah Cutting in Jan 2, 1751/52 at Lancaster, Worcester Co., MA, USA, Shrewsbury VR: Jan. 2, 1751. Orphah Houghton and Aaron Glazer declared their intentions of marriage on Dec 11, 1776 Lancaster, Worcester Co., MA, USA; h/2; Orpha Cooting. Orphah Houghton married Aaron Glazer in Dec 25, 1777 at Holden, MA, USA. Vashti Houghton and Jonathan Prescott declared their intentions of marriage on Apr 11, 1746 Lancaster, Worcester Co., MA, USA; JWH: 7,3,1846 (CJV: error.) Vashti Houghton married Jonathan Prescott, son of Ebenezer Prescott and Ruth Hobart, in Jul 3, 1746 at Lancaster, Worcester Co., MA, USA. Solomon Houghton and Deliverance Ross declared their intentions of marriage on Jul 11, 1751 Lancaster, Worcester Co., MA, USA. Solomon Houghton married Deliverance Ross in Nov 7, 1751 at Lancaster, Worcester Co., MA, USA, by J. Mellen; JWH: 30 Dec 1784 [for both Solomon and his brother Tirus]. Tiras Houghton and Rachel House declared their intentions of marriage on Dec 30, 1754 Lancaster, Worcester Co., MA, USA; JWH: 12,30,1784. Tiras Houghton married Rachel House in Jan, 1755 at Lancaster, Worcester Co., MA, USA, Mrs. Rachel House. Burial Old Burial Ground, Boylston, Worcester Co., MA, USA, Hiram ye son of Mr.
Nathaniel Bixby and Jerusha Houghton declared their intentions of marriage on Aug 27, 1742 Lancaster, Worcester Co., MA, USA; FWH: mar 1741; MLM: also int. Dec. 6, 1741. Nathaniel Bixby and Jerusha Houghton declared their intentions of marriage on Sep, 1742 Shrewsbury, Worcester Co., MA, USA. Mary Matthews and Saul Houghton declared their intentions of marriage on Apr 11, 1746 Lancaster, Worcester Co., MA, USA; JWH, MLM: 5,11,1746. Josiah Cutting and Orphah Houghton declared their intentions of marriage on Oct 1, 1751 Lancaster, Worcester Co., MA, USA. Josiah Cutting married Orphah Houghton, daughter of Joshua Houghton and Elizabeth Bennett, in Jan 2, 1751/52 at Lancaster, Worcester Co., MA, USA, Shrewsbury VR: Jan. 2, 1751. Aaron Glazer and Orphah Houghton declared their intentions of marriage on Dec 11, 1776 Lancaster, Worcester Co., MA, USA; h/2; Orpha Cooting. Aaron Glazer married Orphah Houghton, daughter of Joshua Houghton and Elizabeth Bennett, in Dec 25, 1777 at Holden, MA, USA. Jonathan Prescott and Vashti Houghton declared their intentions of marriage on Apr 11, 1746 Lancaster, Worcester Co., MA, USA; JWH: 7,3,1846 (CJV: error.) Jonathan Prescott married Vashti Houghton, daughter of Joshua Houghton and Elizabeth Bennett, in Jul 3, 1746 at Lancaster, Worcester Co., MA, USA. Deliverance Ross and Solomon Houghton declared their intentions of marriage on Jul 11, 1751 Lancaster, Worcester Co., MA, USA. Deliverance Ross married Solomon Houghton, son of Joshua Houghton and Elizabeth Bennett, in Nov 7, 1751 at Lancaster, Worcester Co., MA, USA, by J. Mellen; JWH: 30 Dec 1784 [for both Solomon and his brother Tirus]. Rachel House and Tiras Houghton declared their intentions of marriage on Dec 30, 1754 Lancaster, Worcester Co., MA, USA; JWH: 12,30,1784. Rachel House married Tiras Houghton, son of Joshua Houghton and Elizabeth Bennett, in Jan, 1755 at Lancaster, Worcester Co., MA, USA, Mrs. Rachel House. 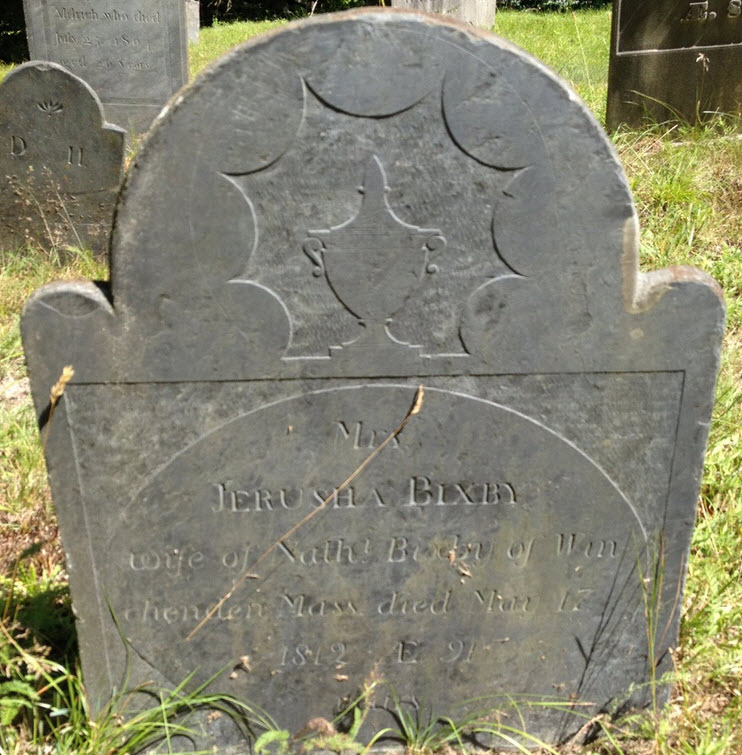 Elizabeth Rugg married Gershom Houghton, son of Robert Houghton and Esther Leppingwell, in Feb 23, 1724/25 at Lancaster, Worcester Co., MA, USA, Nourse: by J. Houghton. Elizabeth Rugg married Daniel Knight in May 12, 1758 at Lancaster, Worcester Co., MA, USA. Marriage Jul 3, 1750 Lancaster, Worcester Co., MA, USA, by Josiah Converse, Esq. Abiathar Houghton Sr and Milicent Carter declared their intentions of marriage on Mar 3, 1749/50 Lancaster, Worcester Co., MA, USA; MLM: Mar. 17, 1749. Abiathar Houghton Sr married Milicent Carter, daughter of Samuel Carter Jr. and Jemimah Houghton, in Jul 3, 1750 at Lancaster, Worcester Co., MA, USA, by Josiah Converse, Esq. Tamar Houghton and Levi Woods declared their intentions of marriage on Dec 4, 1762 Petersham, Worcester Co., MA, USA. Tamar Houghton married Levi Woods in Apr 20, 1763 at Lancaster, Worcester Co., MA, USA, Lancaster VRs: p.102; 2 - Petersham VR,p. 111. Joanna Joslin married Thomas Houghton Sr, son of Robert Houghton and Esther Leppingwell, in Nov 22, 1722 at Concord, Middlesex Co., MA, USA, by Justice Minott; Baily: mp and Dec 22, 1722.